Chrissy McRoberts still calls her favourite coffee shop by its proper name – Blackwater. But she could also call it her office, and even her showroom. Many mornings she’s perched near the front of the downtown café, sipping coffee at a 6’6” long table she made from recycled construction lumber. 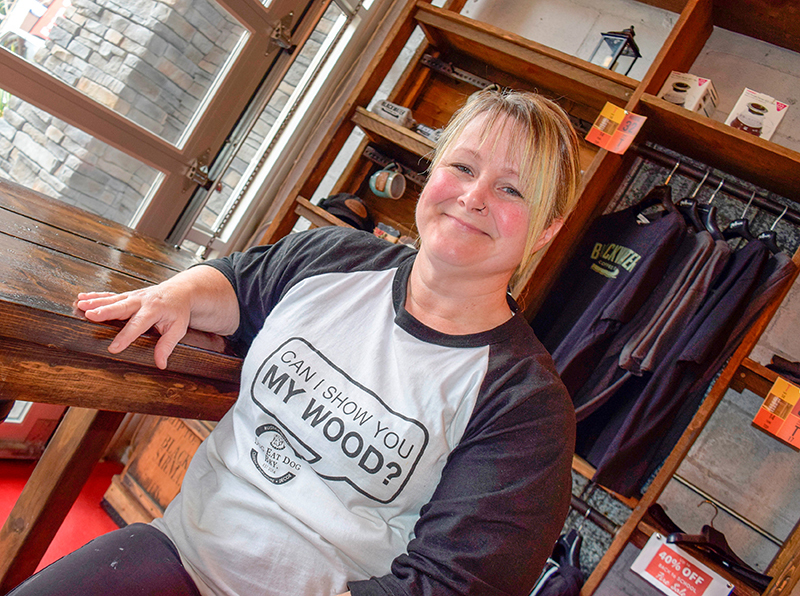 She custom-built the table for Blackwater owner Dave Duguay, designing it to his specifications, sanding the wood, sealing it with epoxy and adding a bit of whimsy by filling in gaps with coffee beans. When Duguay approached McRoberts to build the table for Blackwater he knew she was already in the business of creating small household furniture from salvaged materials. But it was the first time she tried her hand at furniture for commercial use. Not only was the table well received by café customers, it kick-started a new line for McRoberts that’s driving her business in a new and bigger direction. Business is booming and she’s currently booked up until March. McRoberts’ singular brand of primitive furniture is now in 21 commercial properties, from display tables at One Tooth to reception desks at a downtown law firm and a pub table at Paddy Flaherty’s restaurant. Last summer, she designed and built an open shelving unit for Blackwater that’s10 feet high and six feet long. It’s made from discarded construction wood and accented with railway nails and tin from a barn near Petrolia. Without the overhead of a big shop or staff she estimates she can produce durable, functional furniture for 30% to 40% less than larger manufacturers. “It’s good for the environment, it’s custom built, and it’s done with a sense of humour,” she said. Her prices are lower because she doesn’t pay for most materials. “Industries and construction sites in town invite me to pick through their discarded wood. If I take it, they save on landfill fees and everyone gets to boast about recycling. “I also do boulevard boutique shopping,” she added with a laugh. McRoberts, 48, has no formal woodwork training. She grew up in Point Edward and has a background in hotel management. She also spent six years in the Canadian Air Force and Navy reserves. She said she gleaned some knowledge from family members but is mostly self-taught, learning from trial and error during a home reno. Building furniture was never really the plan. In 2014, she decided she didn’t want to work for others and launched a dog treat business called Dog Eat Dog Bakery. Baking and selling dog treats led to building dog beds. That led to small tables and home accessories like clocks and shelving. Now her niche is bigger commercial pieces. Dog Eat Dog household furniture and accessories are available at Belly Babe Maternity Boutique on Lochiel Street. For more details, visit www.dogeatdogbky.com or find her on Facebook. Call 519-384-0888.